Includes a sample of nine study library resources. Details below. After you've started downloading, be sure to sign up for the free SwordSearcher Bible Software newsletter. A printable user manual is available to help you use SwordSearcher to its fullest potential. SwordSearcher also includes a comprehensive help file in the software. No personal information or payment is required. This is only a small sample of what SwordSearcher offers. See the complete list of the SwordSearcher Deluxe Edition study library included in the full Deluxe edition. Try the full version instead! DVD or instant download available. 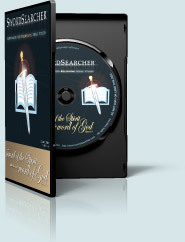 The best way to try SwordSearcher Bible Software is to get the full, Deluxe edition! It's only $59.95 and comes with a 30-day money-back guarantee. Order now and try SwordSearcher with the complete study library— hundreds of volumes including Bible texts, commentaries, dictionaries, topical guides, encyclopedias, and books. Already a SwordSearcher User? Need more books in your SwordSearcher Library? Browse the forum SwordSearcher Modules Repository. Your download should start right away. Please subscribe to the SwordSearcher newsletter so we can send you tips to help you get the most out of SwordSearcher. We will never sell or give your email address away, and you can unsubscribe at any time.